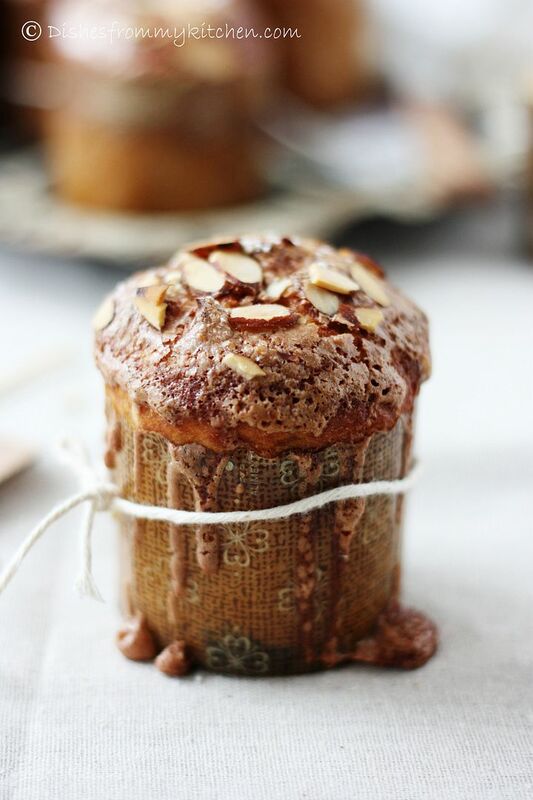 Dishesfrommykitchen: PANETTONE - DECEMBER DARING ! Wishing you all a very Happy and Prosperous New Year 2013 ! Panettone is a type of sweet bread loaf originally from Milan (in Milanese it is called "paneton" Milanese dialect usually prepared and enjoyed for Christmas and New Year in Italy, southeastern France, Brazil, Peru, Malta, Germany and Switzerland, and is one of the symbols of the city of Milan. In South America, especially in Brazil, Argentina, Uruguay, Venezuela, Colombia, Peru and Chile, it is a Christmas dinner staple and in some places replaces roscón de reyes/bolo rei (King cake). Folk legends abound about how Panettone became associated with Christmas. Some say the sweet Milanese bread was developed in the 1400's by the Duke's falconer and his love Adalgisa, a poor baker's daughter. Working in secret at night, the two created a rich bread that revived the bakery's business. At Christmas, they added dried fruit and citron, a resounding success that made the baker wealthy, and allowed the couple to marry. A less romantic possibility is that as a "Pane di Tono" or luxury bread, the lofty loaf with it's expensive ingredients, and long proofing and preparation time it was reserved for Christmas. As with all ancient recipes, several legends circulate about how one came into being. The most popular are the romantic versions. How typical of the Italians to meld together romance and food. Today, the bread is produced and shipped throughout the world. It is always given away as gifts and graces the tables of all Italians at Christmas. 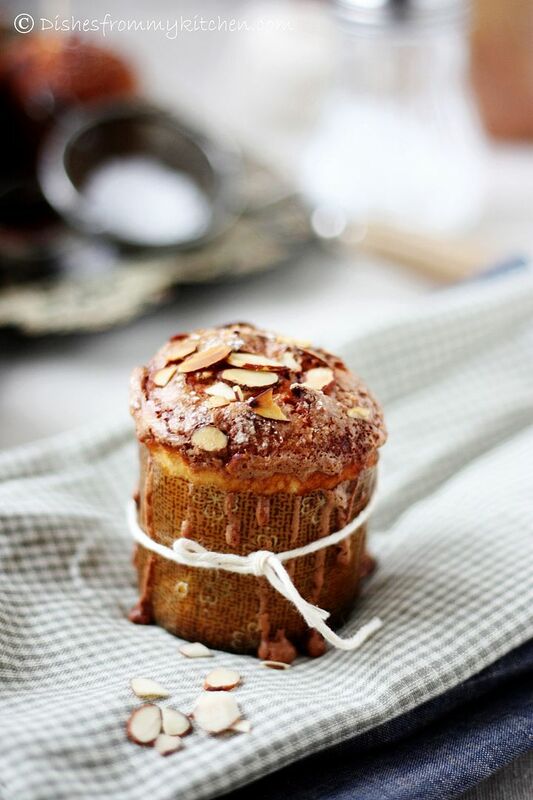 I had made the panettone right in time for the Daring baker, but was very busy after that did not have time to come up with the post. So I am posting this delayed. Even though the whole process is time consuming and takes a whole day, it’s worth the time spent. 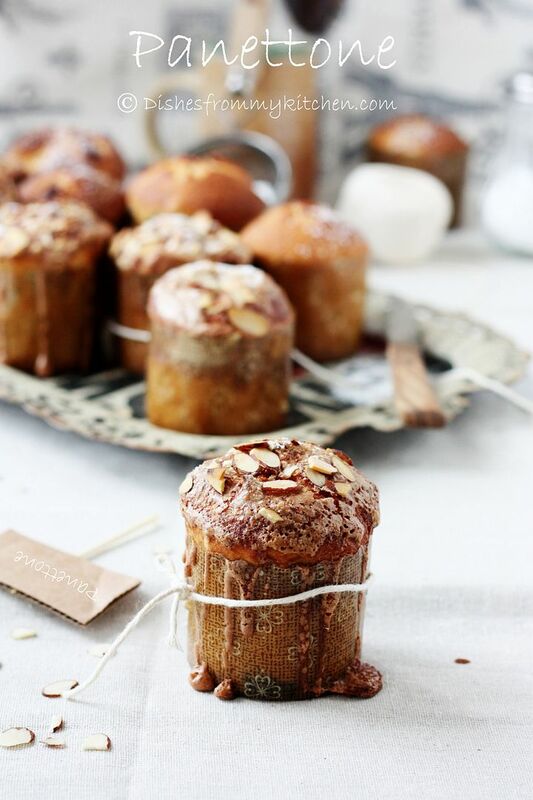 When I visited Italy I eat lot of Panettone, but still wanted to do this for Daring baker. The satisfaction of doing your own Panettone cannot be explained in words, it needs to be experienced. This is my first post for new year 2013 and I wanted to start the year with a sweet bread which is rich in history and taste. 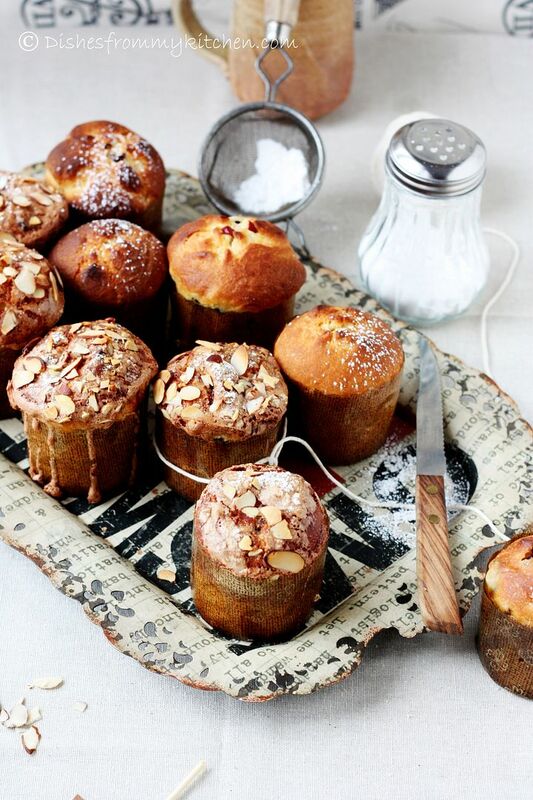 I halved the recipe and made 12 mini Panettone with 6 Panettone glazed and 6 Panettone without Glazing. 3. Cover with plastic wrap and allow to double in size for about 20 to 30 minutes. 3. Stir in the eggs, flour and sugar. 1. Be sure to have your dough in a large bowl as above. 2.With a wooden spoon mix in eggs, egg yolk, sugar, honey, vanilla, essences/extracts and salt. 4. Then add the flour. Stir until smooth. 5. At this stage the dough will seem a little too soft, like cookie dough. 6. Turn it out and knead it on a well-floured surface until it sort of holds its shape. Don’t knead in too much flour but you may need as much as 2/3 cup (100 gm). Be careful the excess flour will affect the finished product. 1. Oil a large bowl lightly, plop in your dough and cover with plastic wrap. 2. Now we need to let it rise until it has tripled in size. There are two ways to go about this. 3. Rise in a warm place for 2 – 4 hours Or find a cool spot (64°F -68°F) (18°C – 20°C) and rise overnight Or rise for 2 hours on your kitchen bench then slow the rise down and place in the refrigerator overnight. If you do this it will take some time to wake up the next morning but I preferred this method. 1. Soak the raisin/sultanas in water 30 minutes before the end of the first rise. Drain and pat dry with paper towels. 2. Now take your dough and cut it in half. Remember we are making two panettone. 3. Combine all your filling ingredients and mix well. 4. Press out one portion of dough into an oval shape. 5. Sprinkle over one quarter of the filling and roll up the dough into a log. 6. Press out again into an oval shape and sprinkle over another quarter of the filling. 7. Roll into a log shape again. 8. Repeat with the second portion of dough. 9. 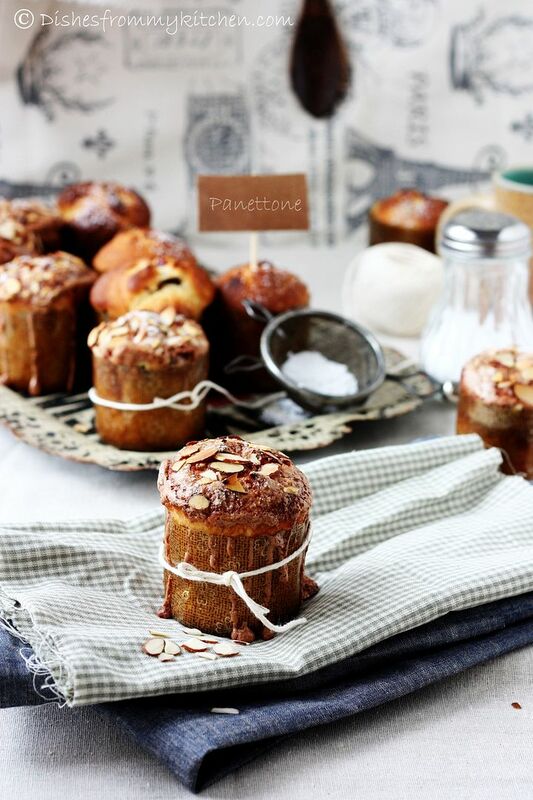 Shape each into a ball and slip into your prepared pans, panettone papers or homemade panettone papers. 10. 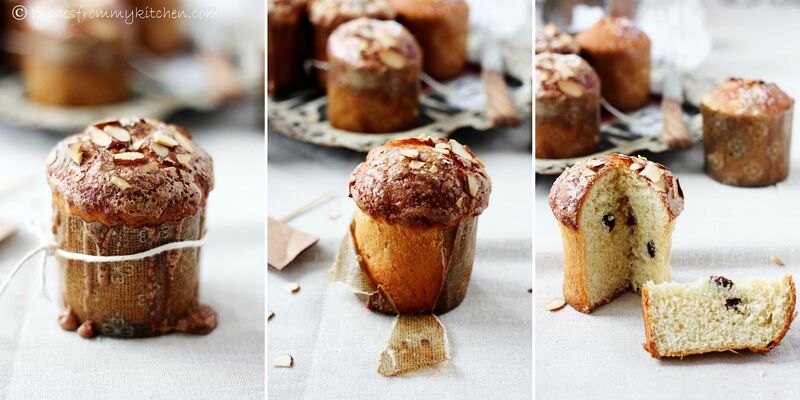 Cut an X into the top of each panettone and allow to double in size. 11. Rising time will vary according to method of first rise. If it has been in the refrigerator it could take 4 hours or more. If it has been rising on the kitchen bench in a warm place it should be doubled in about 2 hours. 2. Just before baking carefully (don’t deflate it!) cut the X into the dough again and place in a knob (a nut) of butter. 3. 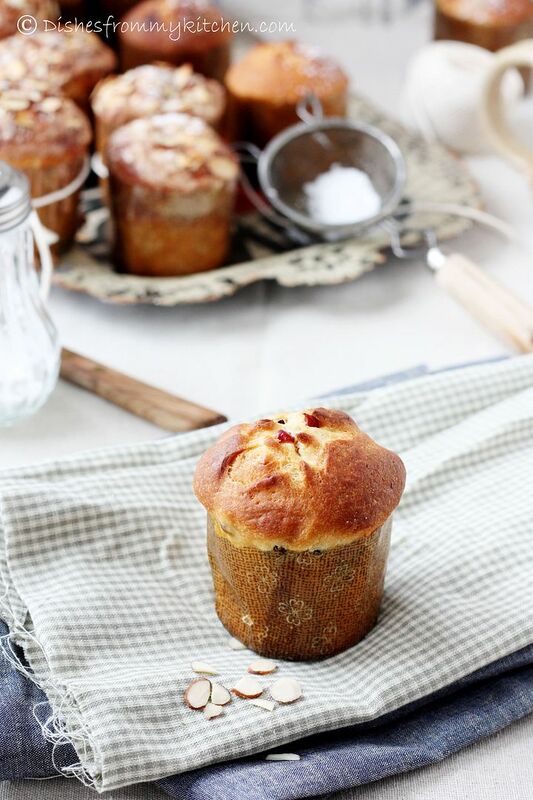 Place your panettone in the oven and bake for 10 minutes. 4. Reduce the heat to moderate 350°F and bake for another 10 minutes. 5. Reduce the heat again to moderate 325°F and bake for 30 minutes until the tops are well browned and a skewer inserted into the panettone comes out clean. 6. Cooling your panettone is also important. 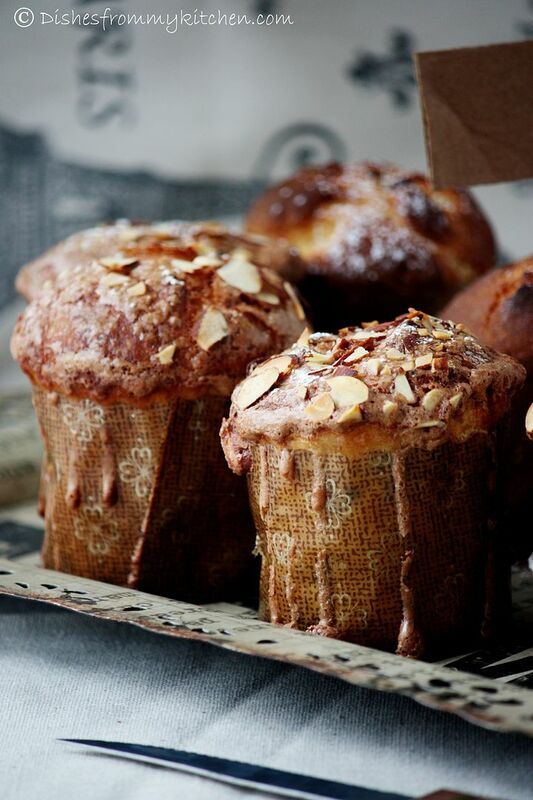 If you have use papers (commercial or homemade) lie your panettone on their side cushioned with rolled up towels. Turn gently as they cool. If you have used pans cool in the pans for 30 minutes then remove and cushion with towels as above. 7. Panettone can also be cooled suspended. How to do this? Firstly you need to use papers (commercial or homemade), insert clean knitting needles into the bottom of the panettone in a X shape. Flip over and support the knitting needles on the edges of a large saucepan with the panettone suspended within the saucepan. 8. 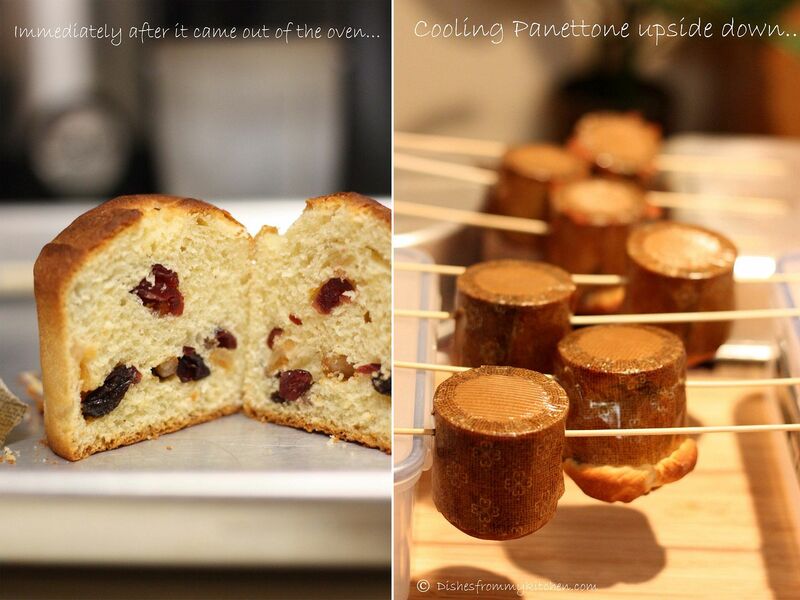 For Small Panettone it took 20 to 22 minutes altogether first 10 minutes in 350°F and after that 12 minutes in 325°F. If you check inside the internal temperature it has to be 185F. If you are not glazing follow the above procedure with the x mark with blob of butter. Otherwise follow this procedure with glazing. To mix the glaze, whisk all ingredients together. Brush the glaze evenly onto the top of the Panettone. 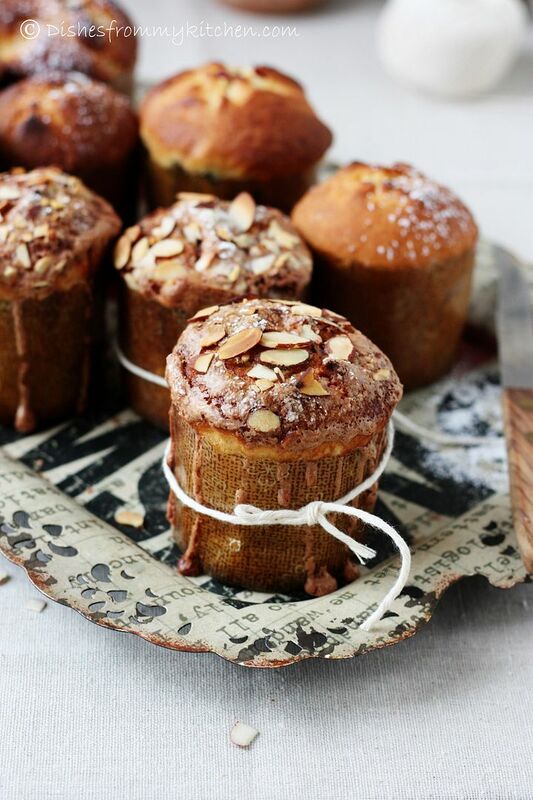 Sift powdered sugar over the tops, then sprinkle with pearl sugar and a few whole blanched almonds. Then Bake as said above. Very nice post...Happy New Year!! They turned out perfect! 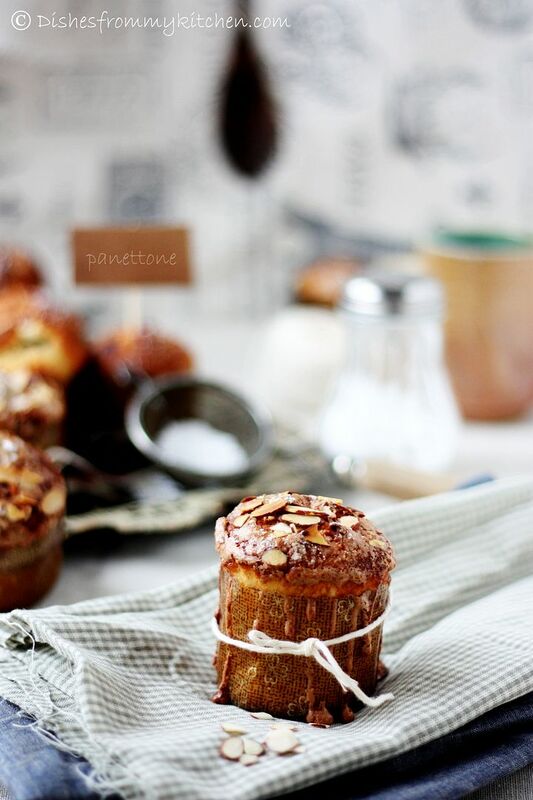 Presentation is beautiful and mini panettones are so cute! Splendid pics!!! Happy new year to u!! perfect start Pavi! suuuuupppper presentation! so yummy! Awesome...........happy new year to you too. 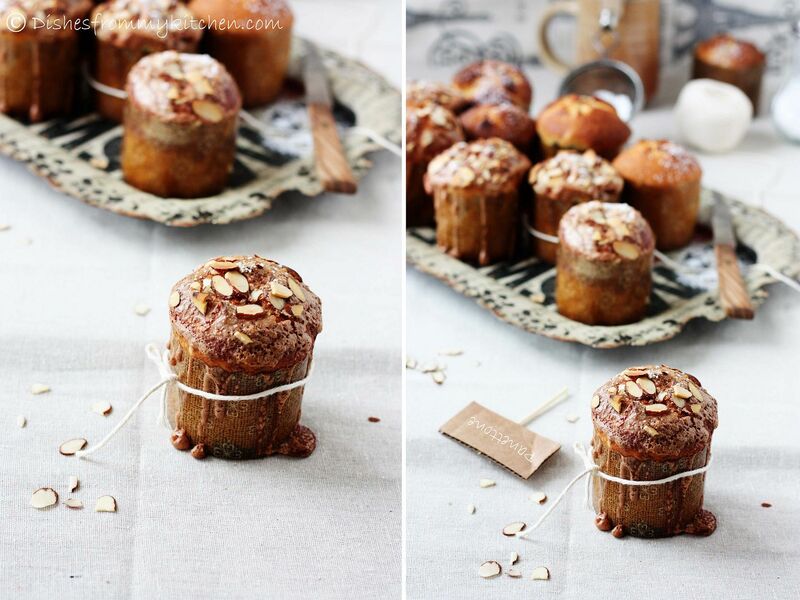 The mini panettones look amazing. 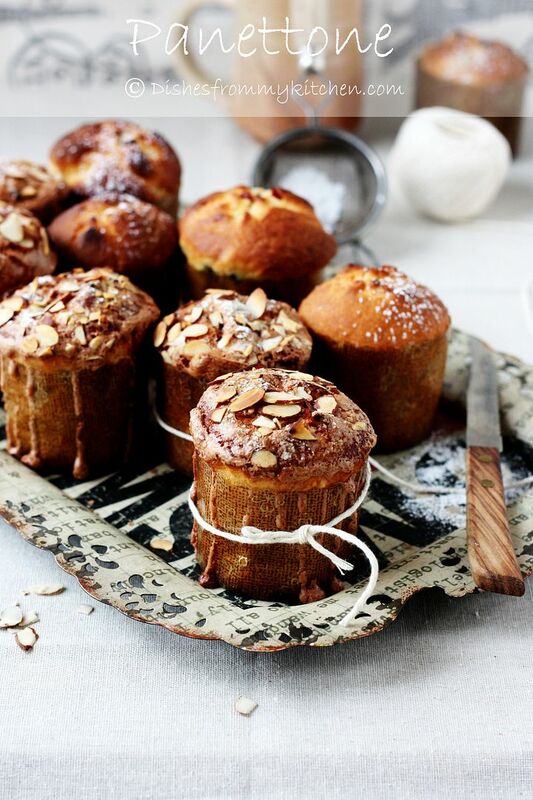 Well baked, well presented and I am sure scrumptious too. Your photography is wonderful. superbly baked n presented n grt clicks..
Feast for eyes..well presented and clicks are awesome..
Gorgeous mini treats! The crumb looks amazing, just perfect! Thanks for you shared it out here, cause I sure did miss eating this in Italy and I never even heard of it before. 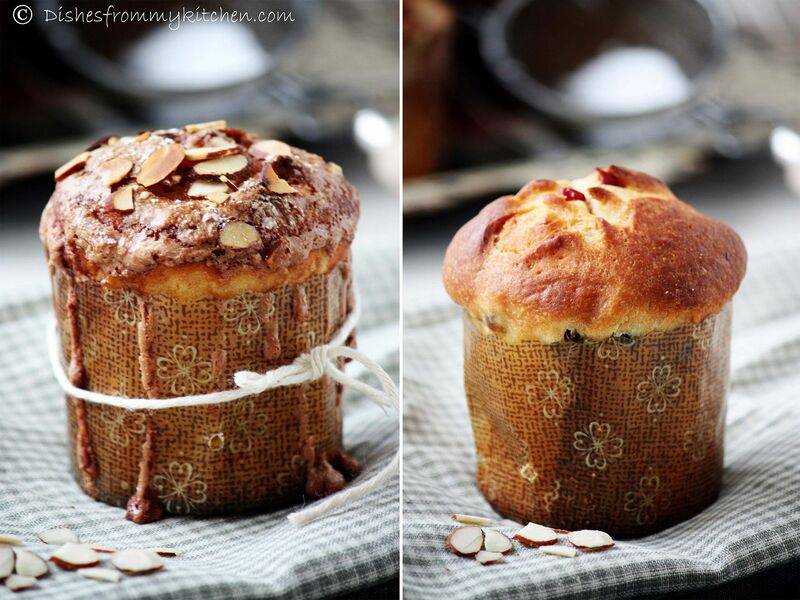 Happy new year wishes to you and your family.Breath taking clicks Pavi, real feast for eyes.Beautiful panettone. Looks really yummy. Never tried or tasted this before. Awesome. Your pictures are stunning! 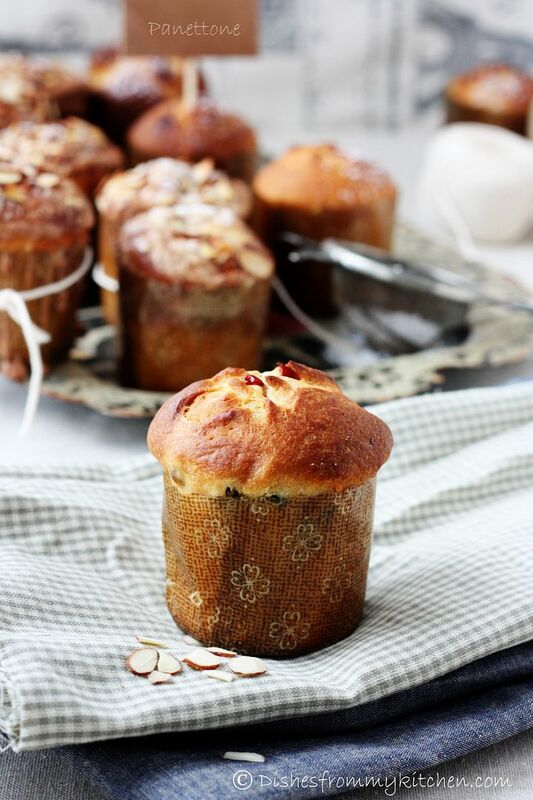 My husband loves Panettone so I will have to try this recipe! Thank you! 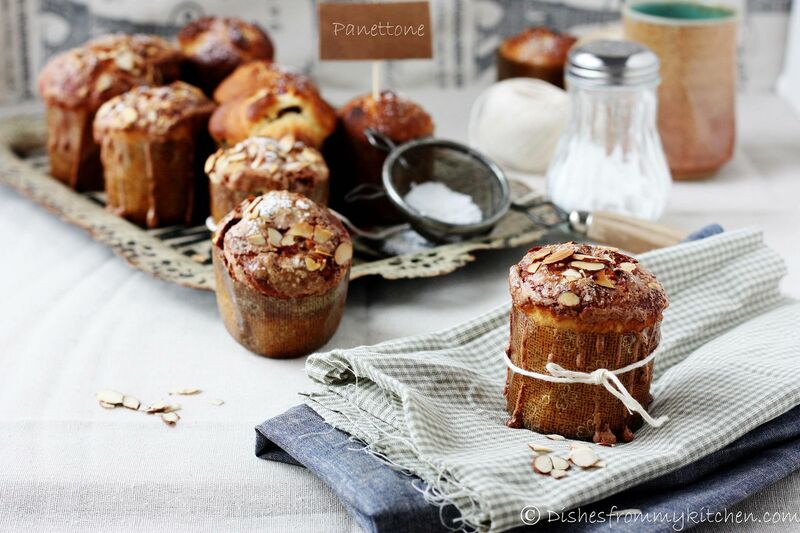 beautiful pannettoni wonderful pictures, and blog. Pavithra, your pictures are stunning! Love it! Hi, can I make in muffin pan? ?